Mustard seed is one of the most popular traded spices in the world today. While many cultures enjoy its spicy and aromatic characteristics, it is said that the ancient Romans were the first inventors of mustard seed paste. This recipe using prosciutto is one to share! Not only will it beat the heat but it will also satisfy everyone’s sweet-tart cravings. With the addition of Tallegio cheese and pineapple, this delectable recipe using prosciutto hits the perfect balance of creamy and cool. In a medium saucepan combine pineapple and sugar; set aside. Steep mustard seed in 1 cup hot water for 30 minutes; drain. Add mustard seed and mustard powder to pineapple mixture. Simmer gently 20 minutes or until tender. Remove from heat. Stir in vinegar and salt. Let cool and then chill. Combine prosciutto and milk in food processor. Process until smooth. Add cheese; process until smooth, scraping down bowl occasionally. Place prosciutto mixture into a large bowl. In a separate bowl beat heavy cream until stiff peaks form. Fold half of the whipped cream into the prosciutto to lighten it. Fold in the remaining whipped cream. Place in a piping bag; chill. 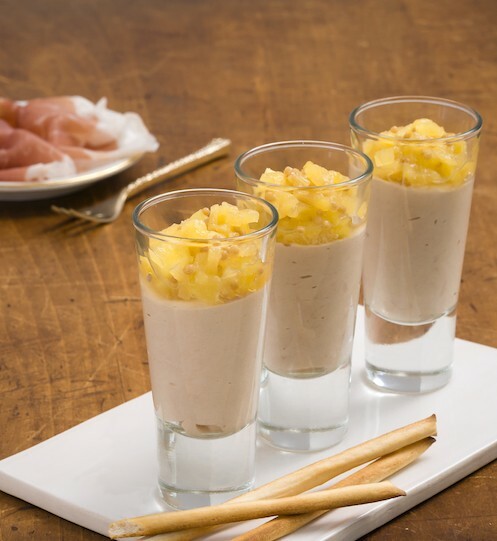 To serve, pipe mousse into 2-to-3-ounce shot glasses filling them halfway. Top with a spoonful of the pineapple mostarda. Break grissini into pieces and place them at angles into the glass to be used as dippers.